TROPICAL FLAIR AND SUN DRENCHED BEACHES ARE YOURS AT THIS BEACHFRONT CONDO AT CASTLE BEACH ON ESTERO ISLAND. 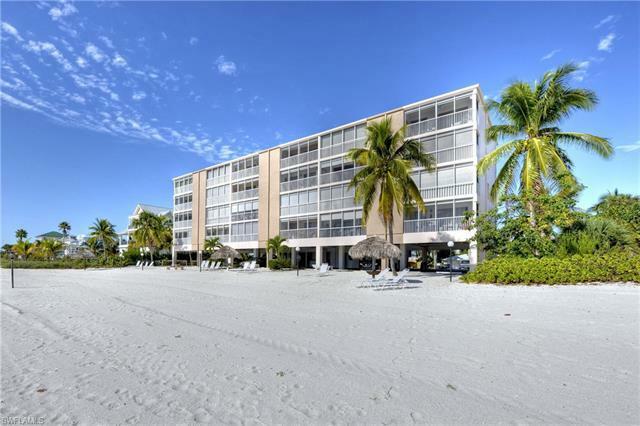 TURNKEY FURNISHED, THIS 2 BEDROOM 2 BATH CONDO HAS AN EXTENSIVE RENTAL HISTORY AND IS ONE OF THE FEW PROPERTIES ON FORT MYERS BEACH THAT ALLOWS WEEKLY RENTALS. THE UNIT HAS BEEN CONTINUOUSLY UPDATED, INCLUDING GRANITE COUNTERS, BEACHWOOD STAINED CEILINGS, TWO FULL BATHROOMS AND TILE FLOORS THROUGHOUT. ADDITIONAL FEATURES INCLUDE IMPACT WINDOWS, ELECTRIC ROLL DOWN SHUTTERS AND A DEEDED COVERED PARKING SPACE. THE ONLY THING MISSING IS YOU.